“Bulgaria is the place to be!“, says Sylvester Stallone in the country’s new promotional video. He and five other world celebrities are the headliners in the clip who do not only promote our country but also showcase their own personal attitude to Bulgaria as a must-see and experience place. These celebrities willingly use their popularity to tell the world about their experience of Bulgaria and to invite fans to come and visit. The video premiered on Sunday (11th October) and was officially presented by the Minister of Tourism Nikolina Angelkova. The video has two versions - the 2-minute one promotes the cinema industry and the ample available possibilities for film producers while the 30-second clip is targeted at the wider public and promotes the country in general. “We’ve been working on this video for about 10 months and I can safely say that this is one of the best examples of a public-private partnership. The video has been produced by Nu Boyana Film Studios which provided the footage for the promotional clip. No state funds have been invested in it. “This clip showcases a change in the way we want our country to be perceived and promoted abroad”, stressed Minister Angelkova.. The Minister and the CEO of the film studios Yariv Lerner signed a partnership agreement which arranges the transference of the full copyrights for the video to the Ministry of Tourism so that it could be used pro bono for the promotion of the country as a tourist destination. 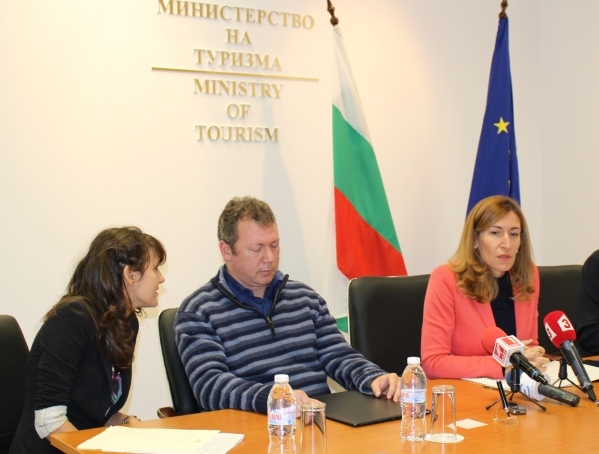 “The video also highlights the close connection between the tourism and the cinema industries which would hopefully attract an even greater interest in Bulgaria”, noted Nikolina Angelkova. She explained that facts are quite telling – tourists in England have swelled by 50% after the screening of the Harry Potter sequence. Thailand has experienced an increase of youth tourists by about 22% after the release of The Beach with Leonardo DiCaprio while Croatia has turned into a cinema destination after the shooting of six consecutive seasons of Game of Thrones. “The cinema industry can help us overcome the seasonality of tourism”, added the Minister of Tourism. Yariv Lerner highlighted the importance of capitalizing on the fact that so many world film celebs choose Bulgaria for the location for their movies. He explained that this puts the country in the center of the world’s attention and increases its popularity as a tourist destination. He also noted that the cinema industry brings a great deal of indirect benefits to the state, including an increased number of hotel and restaurant guests, new job openings etc. “This is one of the reasons to set up a work group together with the Ministry of Economy which will create and develop stimuli for the development of the cinema industry”, added Minister Angelkova. She explained that together with all communication channels such as the Internet, TV, international tourist exhibits and others, the new video will also be broadcast during the special screenings in Los Angeles, USA of the Bulgarian Oscar nomination for a foreign language film “The Judgement” (“Sadilishteto”) . This will not only help further promote the Bulgarian Oscar nominee but it will also present to the world film elite the great opportunities for the cinema industry that Bulgaria has to offer.